Unicut Corporation - Fusion is Better. 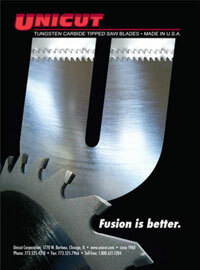 Unicut Corporation is a leading manufacturer of tungsten carbide tipped saw blades and carbide fusion technology. Founded in 1968, Unicut Corporation has introduced many innovative processes that have since become industry standards. Our products include circular, band saw, reciprocating, jig, and hand saw blades as well as custom products designed to meet your specifications. Our unique fusion technology creates a bond between carbide and steel that is up to 400% stronger than conventional brazed carbide tipped blades - Unicut products cut cleaner, cut faster and last longer. Unicut saw blades offer a competitive advantage. We don't stop at expert engineering: our guaranteed product quality, strong customer support, fast turnaround, and competitive pricing make Unicut the number one choice for your cutting tool needs. Unicut's central location in the heart of the Midwest, Chicago, IL, means lower domestic and international shipping costs for our customers. 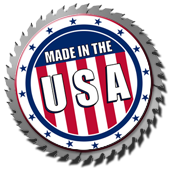 Our products are manufactured to the highest quality standards in the U.S.A.
Click the play button below to check out our Chicago plant and manufacturing process. Unicut Corporation - Your Source for Circular Products, Reciprocal and Jig Saws, Custom Band Saw Blades. © Copyright 2007-. All Rights Reserved. Site design by Eat Paint Studio, Chicago, IL.